This third week of the Kindness Challenge, Niki of The Richness of a Simple Life‘s seven-week initiative had us journeying into the land of Self-Acceptance. As with all the topics we’ve been looking at over these past three weeks, it’s clear how important it is for us to be able to extend to ourselves the same love, compassion, acceptance that we wish to offer others as well. We must be the healthy foundation on which as our outward actions are built. I’ve noticed two things about self-acceptance. First, the very young and the very old are masters of it. Unfortunately there’s a long gap between those stages that offer opportunity to struggle. And it occurred to me that all the ways we don’t accept ourselves, the ways we judge self as less-than-enough, not perfect enough, lacking in some important way, are comparisons to others. Whether we allow that voice to be external – the social conditioning that programs us to believe that thin and rich and in possession of the latest device or status symbol is best; or whether we’ve internalized the critic who tells us we’re hopelessly less-than because our lives don’t match the styled photos on Instagram or we struggle with an illness or challenge, this abandoning and belittling ourselves is not only the antithesis of kindness, it’s soul-withering and destructive. I feel so strongly about this that I want to take up the mantle of self-acceptance and plant my soap box on every street corner in the world and shout my message. I believe we’re here to create, express and experience in alignment with the truth of who we are. That our mission is to be ourselves as purely, clearly, and brightly as we possibly can. Of course there’s nothing wrong with wanting growth and change – evolution and expansion will always be calling us forward, and we should always seek what brings us into greater joy and connection. But we should embrace ourselves with love, and kindness and acceptance always. Beauty is important to me. I always feel a little bit strange when I say that, because I wonder if I’ll be misunderstood. I’m concerned people will think I’m saying physical appearances are important to me, and if that’s true then I should actually care more about how I look. And clearly my outer wrapper isn’t all that beautiful, at least according to current social standards. But that’s not what I mean at all. I believe we give a gift to the things in our life by seeing them – that it is our eyes witnessing them that creates some kind of magic that allows them to shine even more brightly because we are consciously receiving the gift they are giving by their very being. Each one of us has a part in making the world a more and more beautiful place, and that’s what I mean when I say beauty is important to me. A world that’s filled with harmony and loving-kindness; appreciation and celebration; equality and goodwill. It is my belief that we all need to be full our ourselves. I would put that call out to everyone: Be You to Full. Beautiful. And that’s why I see self-acceptance as so critical. What about you? Do you see your beauty? Are you leaning into self-acceptance? Are you willing to know you shine? Do tell – you know I love to hear. Inner beauty attracts inner beauty, and those souls shine–reflect one another’s love. You are a beautiful person, Deborah. Your words illuminated me! Thank you so much for these inspirational words. 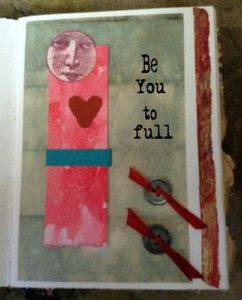 I love the ‘Be You To Full’, it is a new and interesting perspective. After reading your “we give a gift to the things in our life by seeing them – that it is our eyes witnessing them that creates some kind of magic…” I find new meaning to the phrase ‘beauty is more than skin deep’. An art teacher in Adele Geras’ Egerton Hall trilogy talks about showing ‘the thingness of a thing’. That’s stuck with me, and it seems to resonate with the Connie Kaplan passage you quote. I love that Kathleen – yes the thingness of a thing. And I’m seriously smiling because unbelievably someone was just talking to me about books they read in series set in a boarding school loosely based on the Rapunzel story. I’m betting this is the very trilogy she was trying to remember the name of. How extraordinary you should provide the needed clue. It was worthwhile ‘the wait’, beautiful words about beauty by a Beautiful Soul. Oh Patty – thank you. I’m holding your kind words in my heart.